The most recent United States Census officially recognized five racial categories (White American, Black or African American, Native American and Alaska Native, Asian American, and Native Hawaiian and Other Pacific Islander) as well as people of two or more races. The Census Bureau also classified respondents as "Hispanic or Latino" or "Not Hispanic or Latino", identifying Hispanic and Latino as an ethnicity (not a race), which comprises the largest minority group in the nation. The United States Supreme Court unanimously held that "race" is not limited to Census designations on the "race question" but extends to all ethnicities, and thus can include Jewish (which has the unique status as both an ethnicity and a religion), Arab, Hungarian, Laotian, Zulu, etc. The Census also asked an "Ancestry Question," which covers the broader notion of ethnicity, in the 2000 Census long form and the American Community Survey; the question will return in the 2020 Census. As of July 2016[update], White Americans are the racial majority. African Americans are the largest racial minority, comprising an estimated 12.7% of the population. Hispanic and Latino Americans are the largest ethnic minority, comprising an estimated 17.8% of the population. The White, non-Hispanic or Latino population make up 61.3% of the nation's total, with the total White population (including White Hispanics and Latinos) being 76.9%. White Americans are the majority in every census-defined region (Northeast, Midwest, South, West) and in every state except Hawaii, but contribute the highest proportion of the population in the Midwestern United States, at 85% per the Population Estimates Program (PEP) or 83% per the American Community Survey (ACS). [verification needed] Non-Hispanic Whites make up 79% of the Midwest's population, the highest ratio of any region. However, 35% of White Americans (whether all White Americans or non-Hispanic/Latino only) live in the South, the most of any region. Currently, 55% of the African American population lives in the South. A plurality or majority of the other official groups reside in the West. The latter region is home to 42% of Hispanic and Latino Americans, 46% of Asian Americans, 48% of American Indians and Alaska Natives, 68% of Native Hawaiians and Other Pacific Islanders, 37% of the "two or more races" population (Multiracial Americans), and 46% of those self-designated as "some other race". White American, European American, or Middle Eastern American: those having origins in any of the original peoples of Europe, the Middle East, or North Africa. Following consultations with Middle East and North Africa (MENA) organizations, the Census Bureau announced in 2014 that it would establish a new MENA ethnic category for populations from the Middle East, North Africa and the Arab world. Some other race: respondents wrote how they identified themselves if different from the preceding categories (e.g. Roma or Aboriginal/Indigenous Australian). However, 95% of the people who report in this category are Hispanic Mestizos. [dead link] This is not a standard OMB race category. Responses have included mixed-race terms such as Métis, Creole, and Mulatto, which are generally considered to be categories of multi-racial ancestry (see below), but, write-in entries reported in the 2000 census also included nationalities (as opposed to ethnicities), such as South African, Belizean, or Puerto Rican, as well as other terms for mixed-race groups like Wesort, Melungeon, mixed, interracial, and others. Two or more races, widely known as multiracial: those who check off and/or write in more than one race. There is no option labelled "two or more races" or "multiracial" on census and other forms; people who report more than one of the foregoing six options are classified as people of "two or more races" in subsequent processing. Any respondent may identify with any number (including all six) of the racial categories. Each person has two identifying attributes, racial identity and whether or not they are of Hispanic ethnicity. These categories are sociopolitical constructs and should not be interpreted as being scientific or anthropological in nature. They have been changed from one census to another, and the racial categories include both "racial" and national-origin groups. In 2007, the Equal Employment Opportunity Commission of the US Department of Labor finalized the update of its EEO-1 report format and guidelines concerning the definitions of racial/ethnic categories. The question on Hispanic or Latino origin is separate from the question on race. Hispanic and Latino Americans have ethnic origins in the countries of Latin America and the Iberian Peninsula. Latin American countries are, like the United States, racially diverse. Consequently, no separate racial category exists for Hispanic and Latino Americans, as they do not constitute a race, nor a national group. When responding to the race question on the census form, each person is asked to choose from among the same racial categories as all Americans, and are included in the numbers reported for those races. Self-identifying as both Hispanic or Latino and not Hispanic or Latino is neither explicitly allowed nor explicitly prohibited. The differences between how Native American and Black identities are defined today (blood quantum versus one-drop and political assumptions) have been based on different historical circumstances. According to the anthropologist Gerald Sider, such racial designations were a means to concentrate power, wealth, privilege and land in the hands of Whites in a society of White hegemony and privilege (Sider 1996; see also Fields 1990). The differences had little to do with biology and more to do with the history of slavery and its racism, and specific forms of White supremacy (the social, geopolitical and economic agendas of dominant Whites vis-à-vis subordinate Blacks and Native Americans). They related especially to the different social places which Blacks and Amerindians occupied in White-dominated 19th-century America. Sider suggests that the blood quantum definition of Native American identity enabled mixed-race Whites to acquire Amerindian lands during the allotment process. The one-drop rule of Black identity, enforced legally in the early 20th century, enabled Whites to preserve their agricultural labor force in the South. The contrast emerged because, as peoples transported far from their land and kinship ties on another continent, they became reduced to valuable commodities as agricultural laborers. In contrast, Amerindian labor was more difficult to control; moreover, Amerindians occupied large territories that became valuable as agricultural lands, especially with the invention of new technologies such as railroads. Sider thinks the blood quantum definition enhanced White acquisition of Amerindian lands in a doctrine of Manifest Destiny, which subjected Native Americans to marginalization and resulted in numerous conflicts related to American expansionism. The political economy of race had different consequences for the descendants of aboriginal Americans and African slaves. The 19th-century blood quantum rule meant that it was relatively easier for a person of mixed Euro-Amerindian ancestry to be accepted as White. The offspring of a few generations of intermarriage between Amerindians and Whites likely would not have been considered Amerindian (at least not in a legal sense). Amerindians could have treaty rights to land, but because an individual with only one Amerindian great-grandparent no longer was classified as Amerindian, he lost a legal claim to Amerindian land, under the allotment rules of the day. According to Sider's theory, Whites were more easily able to acquire Amerindian lands. On the other hand, the same individual who could be denied legal standing in a tribe, according to the government, because he was "too White" to claim property rights, might still have enough visually identifiable Amerindian ancestry to be considered socially as a "half-breed" or breed, and stigmatized by both communities. Over the centuries when Whites wielded power over both Blacks and Amerindians and believed in their inherent superiority over people of color, they created a social order of hypodescent, in which they assigned mixed-race children to the lower-status groups. They were often ignorant of the systems among Native American tribes of social classification, including kinship and hypodescent. The Omaha people, for instance, who had a patrilineal kinship system, classified all children with white fathers as "white", and excluded them as members of the clans and tribe, unless one was formally adopted by a male member. Tribal members might care for mixed-race children of white fathers, but considered them outside the hereditary clan and kinship fundamental to tribal society. The hypodescent social construction related to the racial caste that was associated with African slavery and the conditions of the slave societies. It was made explicit by Virginia and other colonies' laws as early as 1662. Virginia incorporated the Roman principle of partus sequitur ventrem into slave law, saying that children of slave mothers were born into their status. Under English common law for subjects, children's social status was determined by the father, not the mother. But the colonists put Africans outside the category of English subjects. Generally, white men were in positions of power to take sexual advantage of black women slaves. But, historian Paul Heinegg has shown that most free African-American families listed in the censuses of 1790–1810 were, in fact, descended from unions between white women and African men in colonial Virginia, from the years when working classes lived and worked closely together, and before slavery had hardened as a racial caste. In the United States, social and legal conventions developed over time by whites that classified individuals of mixed ancestry into simplified racial categories (Gossett 1997), but these were always porous. The decennial censuses conducted since 1790, after slavery was well established in the United States, included classification of persons by race: white, black, mulatto, and Indian (Nobles 2000). But, the inclusion of mulatto was an explicit acknowledgement of mixed race. In addition, before the Civil War, Virginia and some other states had legal definition of "whiteness" that provided for people being classified as white if no more than 1/8 black. (For example, if not born into slavery, Thomas Jefferson's children by his slave Sally Hemings would have been classified as legally white, as they were 7/8 white by ancestry. Three of the four surviving children entered white society as adults, and their descendants have identified as white.) In the late 18th and 19th centuries, people of mixed race often migrated to frontiers where societies were more open, and they might be accepted as white if satisfying obligations of citizenship. The more familiar "one-drop rule" was not adopted by Virginia and other states until the 20th century, but it classified persons with any known African ancestry as black (Davis 2001). Passage of such laws was often urged by white supremacists and people promoting "racial purity" through eugenics, having forgotten the long history of multi-racial unions in the South that comprised the ancestry of many families. The term Hispanic as an ethnonym emerged in the 20th century, with the rise of migration of laborers from Spanish-speaking countries of the western hemisphere to the United States. It includes people who may have been considered racially distinct (Black, White, Amerindian or other mixed groups) in their home countries. Today, the word "Latino" is often used as a synonym for "Hispanic". Even if such categories were earlier understood as racial categories, today they have begun to represent ethno-linguistic categories (regardless of perceived race). Similarly, "Anglo" is now used among many Hispanics to refer to non-Hispanic White Americans or European Americans, most of whom speak the English language but are not of primarily English descent. The United States is a racially diverse country. The growth of the Hispanic population through [igration]] and high birth rates is noted as a partial factor for the US' population gains in the last quarter-century. The 2000 census revealed that Native Americans had reached their highest documented population, 4.5 million, since the US was founded in 1776. In the United States since its early history, Native Americans, African Americans, and European Americans were classified as belonging to different races. For nearly three centuries, the criteria among whites for membership in these groups were similar, comprising physical appearance, assumption of non-European ancestry, and social circle. The criteria for membership in these races diverged in the late 19th century. During and after Reconstruction, after the emancipation of slaves after the Civil War, in the effort to restore white supremacy in the South, whites began to classify anyone with "one drop" of "black blood", or known African ancestry, to be black. Such a legal definition was not put into law until the early 20th century in most southern states, but many established racial segregation of facilities during the Jim Crow era, after white Democrats regained control of state legislatures in the South. Efforts to track mixing between groups led to an earlier proliferation of historical categories (such as "mulatto" and "octaroon" among persons with partial African descent) and "blood quantum" distinctions, which became increasingly untethered from self-reported ancestry. 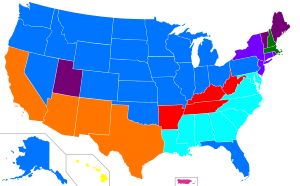 In the 20th century, efforts to classify the increasingly mixed population of the United States into discrete categories generated many difficulties (Spickard 1992). By the standards used in past censuses, many mixed-race children born in the United States were classified as of a different race than one of their biological parents. In addition, a person may change personal racial identification over time because of cultural aspects, and self-ascribed race can differ from assigned race (Kressin et al. 2003). Suburbanization period after World War II, with "white flight" to new housing and away from later social unrest, followed by "black flight"
Air conditioning has promoted migration from northern areas to the Sun Belt, aided by states' rules against union labor and having low taxes for businesses. The Jet Age promoted vacationing and part-time living in warmer areas (snowbirding). White and European Americans are the majority of people currently living in the United States. White people are define by the United States Census Bureau as those "having origins in any of the original peoples of Europe, the Middle East, or North Africa." Like all official U.S. racial categories, "White" has a "not Hispanic or Latino" and a "Hispanic or Latino" component, the latter consisting mostly of White Mexican Americans and White Cuban Americans. White Americans are the majority in 49 of the 50 states, with Hawaii as the exception. Non-Hispanic Whites are the majority in 46 states; Hawaii, New Mexico, California, and Texas (and the District of Columbia) are the exceptions. These five jurisdictions have "minority majorities", i.e. minority groups compose the majority of the population. The non-Hispanic White percentage (63% in 2012) tends to decrease every year, and this sub-group is expected to become a plurality of the overall U.S. population after the year 2043. White Americans overall (non-Hispanic Whites together with White Hispanics) are projected to continue as the majority, at 73.1% (or 303 million out of 420 million) in 2050, from currently 77.1%. Although a high proportion of the population is known to have multiple ancestries, in the 2000 census, the first with the option to choose more than one, most people still identified with one racial category. In the 2000 census, self-identified German Americans made up 17.1% of the U.S. population, followed by Irish Americans at 12%, as reported in the 2000 U.S. Census. This makes German and Irish the largest and second-largest self-reported ancestry groups in the United States. Both groups had high rates of immigration to the U.S. beginning in the mid-19th century, triggered by the Great Famine in Ireland and the failed 1848 Revolution in Germany. However, English Americans and British Americans are still considered the largest ethnic group due to a serious under count following the 2000 census whereby many English and British Americans self-identified under the new category entry 'American' considering themselves 'indigenous' because their families had resided in the US for so long or, if of mixed European ancestry, identified with a more recent and differentiated ethnic group. Most French Americans are believed descended from colonists of Catholic New France; exiled Huguenots, much fewer in number and settling in the eastern English colonies in the late 1600s and early 1700s, needed to assimilate into the majority culture and have intermarried over generations. Isleños of Louisiana and the Hispanos of the Southwest have had, in part, direct Spanish ancestry; most self-reported White Hispanics are of Mexican, Puerto Rican, Argentine, and Cuban origins, each of which are multi-ethnic nations. Hispanic immigration has increased from nations of Central and South America. Black and African Americans are citizens and residents of the United States with origins in Sub-Saharan Africa. According to the Office of Management and Budget, the grouping includes individuals who self-identify as African-American, as well as persons who emigrated from nations in the Caribbean and Sub-Saharan Africawho may alternatively identify as Black or some other written-in race versus African-American given they were not part of the historic US slave system. In this case, grouping is thus based on the geography of the individual, and may contradict or misrepresent their self-identification, for instance not all immigrants from Sub-Saharan Africa are "Black". Among these racial outliers are persons from Cape Verde, Madagascar, various Hamito-Semitic populations in East Africa and the Sahel, and the Afrikaners of Southern Africa including such notable figures as the inventor Elon Musk and actress Charlize Theron. African Americans (also referred to as Black Americans or Afro-Americans, and formerly as American Negroes) are citizens or residents of the United States who have origins in any of the black populations of Africa. According to the 2009 American Community Survey, there were 38,093,725 Black and African Americans in the United States, representing 12.4% of the population. There were 37,144,530 non-Hispanic blacks, which comprised 12.1% of the population. This number increased to 42 million according to the 2010 United States Census, when including Multiracial African Americans, making up 14% of the total U.S. population. [a] Black and African Americans make up the second largest group in the United States, but the third largest group after White Americans and Hispanic or Latino Americans (of any race). The majority of the population (55%) lives in the South; compared to the 2000 Census, there has also been a decrease of African Americans in the Northeast and Midwest. Most African Americans are the direct descendants of captives from West Africa, who survived the slavery era within the boundaries of the present United States. As an adjective, the term is usually written African-American. The first West Africans were brought to Jamestown, Virginia in 1619. The English settlers treated these captives as indentured servants and released them after a number of years. This practice was gradually replaced by the system of race-based slavery used in the Caribbean. All the American colonies had slavery, but it was usually the form of personal servants in the North (where 2% of the people were slaves), and field hands in plantations in the South (where 25% were slaves); by the beginning of the American Revolutionary War 1/5th of the total population was enslaved. During the revolution, some would serve in the Continental Army or Continental Navy, while others would serve the British Empire in Lord Dunmore's Ethiopian Regiment, and other units. By 1804, the northern states (north of the Mason–Dixon line) had abolished slavery. However, slavery would persist in the southern states until the end of the American Civil War and the passage of the Thirteenth Amendment. Following the end of the Reconstruction Era, which saw the first African American representation in Congress, African Americans became disenfranchised and subject to Jim Crow laws, legislation that would persist until the passage of the Civil Rights Act of 1964 and Voting Rights Act of 1965 due to the Civil Rights Movement. According to US Census Bureau data, very few African immigrants self-identify as "African-American" (as "African-American" is usually referring to blacks with deeply rooted ancestory dating back to the US slave period as discussed in the previous paragraph.) On average, less than 5% of African residents self-reported as "African-American" or "Afro-American" on the 2000 US Census. The overwhelming majority of African immigrants (~95%) identified instead with their own respective ethnicities. Self-designation as "African-American" or "Afro-American" was highest among individuals from West Africa (4%-9%), and lowest among individuals from Cape Verde, East Africa and Southern Africa (0%-4%). Nonetheless, African immigrants often develop very successful professional and business working-relationships with African-Americans. In 2008, "Hispanic or Latino origin" was the self-identification of 47 million Americans. They chiefly have origins in the Spanish-speaking nations of Latin America. Very few also come from other places, for example: 0.2% of Hispanic and Latino Americans were born in Asia. The group is heterogeneous in race and national ancestry. The leading country-of-origin for Hispanic Americans is Mexico (30.7 million), followed by Puerto Rico (4.2 million) (which actually has a special relationship with the US, of which its people are citizens), and Cuba (1.6 million), as of 2008. However, as of 2010, there were 1,648,968 Salvadorans in the United States, the largest of the U.S.-Central American community. Salvadorans are poised to become the third largest Hispanic group by the next census, significantly overtaking and replacing Cubans. Recent estimates already put the Salvadoran population as high as 2 million, as of 2013, the third largest Hispanic-American group. 62.4% of Hispanic and Latino Americans identified as white. 30.5% identified as "some other race" (other than the ones listed). According to the PEP 91.9% of Latinos are white, as these official estimates do not recognize "some other race". In the official estimates, Black or African American Hispanics are the second-largest group, with 1.9 million, or 4.0% of the whole group. The remaining Hispanics are accounted as follows, first per the PEP: 1.6% American Indian and Alaska Native, 1.5% two or more races, 0.7% Asian, and 0.03% Native Hawaiian and Other Pacific Islander. Per the ACS: 3.9% two or more races, 1.9% Black or African American, 1.0% American Indian and Alaska Native, 0.4% Asian, and 0.05% Native Hawaiian and Other Pacific Islander. In the United States the Hispanic and Latino population has reached 58 million in 2016. According to Pew Research Center the Latino population has been the principal driver of United States demographic growth since 2000. Mexicans make up most of the Hispanic and Latino population 35,758,000. There is also a growth of Hispanics who are receiving a college education in 2015, 40% of Hispanics age 25 and older have had a college experience. In 2000 the percentage was at a low 30%. In all the 50 US states California houses the largest population percentage of Latinos. In 2015, 15.2 million Hispanics lived in California. The Hispanic or Latino population is young and fast-growing, due to immigration and higher birth rates. For decades it has contributed significantly to U.S. population increases, and this is expected to continue. The Census Bureau projects that by 2050, one-quarter of the population will be Hispanic or Latino. A third significant minority is the Asian American population, comprising 19.4 million in 2013, or 6.0% of the U.S. population. California is home to 4.5 million Asian Americans, whereas 495,000 live in Hawaii, where they compose the plurality, at 38.5% of the islands' people. This is their largest share of any state. Historically first concentrated on Hawaii and the West Coast, Asian Americans now live across the country, living and working in large numbers in New York City, Chicago, Boston, Houston, and other major urban centers. Their histories are diverse. As with the new immigration from central and eastern Europe to the East Coast from the mid-19th century on, Asians started immigrating to the United States in large numbers in the 19th century. This first major wave of immigration consisted predominantly of Chinese and Japanese laborers, but also included Korean and South Asian immigrants. Many immigrants also came during and after this period from the Philippines, which was a US colony from 1898 to 1946. Exclusion laws and policies largely prohibited and curtailed Asian immigration until the 1940s. After the US changed its immigration laws during the 1940s to 1960s to make entry easier, a much larger new wave of immigration from Asia began. Today the largest self-identified Asian American sub-groups according to census data are Chinese Americans, Filipino Americans, Indian Americans, Vietnamese Americans, Korean Americans, and Japanese Americans, among other groups. Not all of Asian Americans' ancestors directly migrated from their country of origin to the US. For example, over 270,000 people from Guyana, a South American country, reside in the US. But a predominant amount of Guyanese people are Indo-Guyanese, or are of Indian descent. Indigenous peoples of the Americas, particularly Native Americans, made up 0.8% of the population in 2008, numbering 2.4 million. An additional 2.3 million persons declared part-American Indian or Alaska Native ancestry. The legal and official designation of who is Native American has aroused controversy by demographers, tribal nations, and government officials for many decades. Federally recognized tribes and state recognized tribes set their own membership requirements; tribal enrollment may require residency on a reservation, documented lineal descent from recognized records, such as the Dawes Rolls, and other criteria. Some tribes have adopted the use of blood quantum, requiring members to have a certain percentage. The federal government requires individuals to certify documented blood quantum of ancestry for certain federal programs, such as education benefits, available to members of recognized tribes. But Census takers accept any respondent's identification. Genetic scientists estimated that more than 15 million other Americans, including African Americans and Hispanic Americans (specifically those of Mexican heritage), may have up to one quarter of American Indian ancestry. Today more than 800,000 to one million persons claim Cherokee descent in part or as full-bloods; of these, an estimated 300,000 live in California, 70,000—160,000 in Oklahoma, and 15,000 in North Carolina in ancestral homelands. The second largest tribal group is the Navajo, who call themselves Diné and live on a 16-million acre (65,000 km²) Indian reservation covering northeast Arizona, northwest New Mexico, and southeast Utah. It is home to half of the 450,000 Navajo Nation members. The third largest group are the Lakota (Sioux) Nation, with distinct federally recognized tribes located in the states of Minnesota, Nebraska, Montana, Wyoming; and North and South Dakota. Native Hawaiians and other Pacific Islanders numbered 427,810 in 2008, or 0.1% of the population. Additionally, nearly as many individuals identify as having partial Native Hawaiian ancestry, for a total of 829,949 people of full or part Native Hawaiian ancestry. This group constitutes the smallest minority in the United States. More than half identify as "full-blooded", but historically most Native Hawaiians on the island chain of Hawaii are believed to have admixture with Asian and European ancestries. But, the Census takes reporting by individuals as to how they identify. Some demographers believe that by the year 2025, the last full-blooded Native Hawaiian will die off, leaving a culturally distinct, but racially mixed population. The total number of persons who have identified as Native Hawaiian in 2008 was more than the estimated Hawaiian population when the US annexed the islands in 1898. Native Hawaiians are receiving ancestral land reparations. Throughout Hawaii, they are working to preserve and assert adaptation of Native Hawaiian customs and the Hawaiian language. They have cultural schools solely for legally Native Hawaiian students. There are an estimated 1.9-2.0 million Middle Eastern Americans according to the U.S. Census, including both Arab and non-Arab Americans, comprising 0.6% of the total U.S. population; however, the Arab American Institute estimates a population closer to 3.6 million. U.S. Census population estimates are based on responses to the ancestry question on the census, which makes it difficult to accurately count Middle Eastern Americans. Though Middle Eastern American communities can be found in each of the 50 states, the majority live in just 10 states with nearly "one third of the total liv[ing] in California, New York, and Michigan". More Middle Eastern Americans live in California than any other state, with ethnic groups such as Arabs, Persians, and Armenians being a large percentage, but Middle Eastern Americans represent the highest percentage of the population of Michigan. In particular, Dearborn, Michigan has long been home to a high concentration of Middle Eastern Americans. The United States Census Bureau is presently finalizing the ethnic classification of MENA populations. Middle Eastern Americans are counted as White on the census. In 2012, prompted in part by post-9/11 discrimination, the American-Arab Anti-Discrimination Committee petitioned the Department of Commerce's Minority Business Development Agency to designate the MENA populations as a minority/disadvantaged community. Following consultations with MENA organizations, the US Census Bureau announced in 2014 that it would establish a new MENA ethnic category for populations from the Middle East, North Africa and the Arab world, separate from the "white" classification that these populations had previously sought in 1909. The expert groups, including some Jewish organizations, felt that the earlier "white" designation no longer accurately represents MENA identity, so they successfully lobbied for a distinct categorization. This process does not currently include ethnoreligious groups such as Jews, who originate from the Levant or Sikhs, as the Bureau only tabulates these groups as followers of religions rather than members of ethnic groups. As of December 2015, the sampling strata for the new MENA category includes the Census Bureau's working classification of 19 MENA groups, as well as Turkish, Sudanese, Somali, Mauritanian, Armenian, Cypriot, Afghan, Iranian, Azerbaijani and Georgian groups. Self-identified multiracial Americans numbered 7.0 million in 2008, or 2.3% of the population. They have identified as any combination of races (White, Black or African American, Asian, American Indian or Alaska Native, Native Hawaiian or other Pacific Islander, "some other race") and ethnicities. The U.S. has a growing multiracial identity movement. Demographers state that, due to new waves of immigration, the American people through the early 20th century were mostly multi-ethnic descendants of various immigrant nationalities, who maintained cultural distinctiveness until, over time, assimilation, migration and integration took place. The Civil Rights Movement through the 20th century gained passage of important legislation to enforce constitutional rights of minorities. A 2002 study found an average of 18.6% European genetic contribution and 2.7% Native American genetic contribution (with standard errors 1.5% and 1.4% respectively) in a sample of 232 African Americans. Meanwhile, in a sample of 187 European Americans from State College, Pennsylvania, there was an average of 0.7% West African genetic contribution and 3.2% Native American genetic contribution (with standard errors 0.9% and 1.6% respectively). Most of the non-European admixture was concentrated in 30% of the sample, with West African admixture ranging from 2 to 20%, with an average of 2.3%. In 1958 Robert Stuckert produced a statistical analysis using historical census data and immigration statistics. He concluded that the growth in the White population could not be attributed solely to births in the White population and immigration from Europe, but was also due to people identifying as white who were partly black. He concluded that 21 percent of white Americans had some recent African-American ancestors. He also concluded that the majority of Americans of known African descent were partly European and not entirely sub-Saharan African. More recently, many different DNA studies have shown that many African Americans have European admixture, reflecting the long history in this country of the various populations. Proportions of European admixture in African-American DNA have been found in studies to be 17 % and between 10.6% and 22.5%. Another recent study found the average to be 21.2%, with a standard error of 1.2%. The Race, Ethnicity, and Genetics Working Group of the National Human Genome Research Institute notes that "although genetic analyses of large numbers of loci can produce estimates of the percentage of a person's ancestors coming from various continental populations, these estimates may assume a false distinctiveness of the parental populations, since human groups have exchanged mates from local to continental scales throughout history." 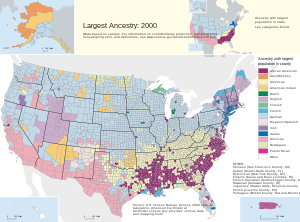 In the 2000 census, the non-standard category of "Other" was especially intended to capture responses such as Mestizo and Mulatto, two large multiracial groups in most of the countries of origin of Hispanic and Latino Americans. However, many other responses are captured by the category. In 2008 15.0 million people, nearly 5% of the total U.S. population, were estimated to be "some other race", with 95% of them being Hispanic or Latino. Due to this category's non-standard status, statistics from government agencies other than the Census Bureau (for example: the Centers for Disease Control's data on vital statistics, or the FBI's crime statistics), but also the Bureau's own official Population Estimates, omit the "some other race" category and include most of the people in this group in the white population, thus including the vast majority (about 90%) of Hispanic and Latino Americans in the white population. For an example of this, see The World Factbook, published by the Central Intelligence Agency. ^ Farley, Reynolds (January 1, 1991). "The New Census Question about Ancestry: What Did It Tell Us?". Demography. 28 (3): 411–29. doi:10.2307/2061465. JSTOR 2061465. PMID 1936376. ^ Collins-Schramm, Heather E. (2002). "Markers that Discriminate Between European and African Ancestry Show Limited Variation Within Africa". Human Genetics. 111 (6): 566–69. doi:10.1007/s00439-002-0818-z. PMID 12436248. ^ Parra, Esteban J.; Marcini, Amy; Akey, Joshua; Martinson, Jeremy; Batzer, Mark A.; Cooper, Richard; Forrester, Terrence; Allison, David B.; Deka, Ranjan; Ferrell, Robert E.; Shriver, Mark D. (1998). "Estimating African American Admixture Proportions by Use of Population- Specific Alleles" (PDF). American Journal of Human Genetics. 63 (6): 1839–1851. doi:10.1086/302148. PMC 1377655. PMID 9837836. Archived from the original (PDF) on March 4, 2009. Retrieved May 16, 2013.